Mika Vainio and Franck Vigroux's brutal yet filigree electronics hauntingly come to light in Ignis, which finally discloses the further, etheric results of recording sessions that made up their Peau Froide, Léger Soleil album in 2014, their celebrated previous collaboration for Cosmo Rhythmatic (COSMO 003CD/LP). 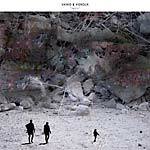 Posthumously issued following Mika's untimely death in 2017, Ignis taps into the pair's mutual respect for unsound and proprioceptive allusion, operating at liminal levels of tonal and spatial perception in a six-track LP that leaves the project with a sense of unresolved tension. Since Mika Vainio's seminal Pan Sonic group with Ilpo Väisänen ceased service in 2009, Mika found one of his sharpest foils in French multi-instrumentalist Franck Vigroux. They embarked on a lengthy creative process, articulated through studio and live performances, resulting in the powerful Peau Froide, Léger Soleil album and stacks of further recordings planned for a second release. The end results of their efforts are collected on Ignis, a set of six parts paying tribute to a mutual fascination with what lies at and beyond the threshold of sonic comprehension. Where their previous effort traded in a mix of colossal, pendulous industrial funk and abyss-baiting doom, this follow-up fully embraces the void in all its glorious mystery. From a trail of icy bleeps, "Brume" lures you into cathedral-like ice cave dimensions with breathtaking cinematic effect, before the antechamber of "Ne Te Retourne Pas" highlights those supposed dimensions with streaks of phosphorescing light to much more paranoid, imposing degrees, before calving off into the mechanical jaws of "Luxure". Deep in the beast's mouth, Vigroux bleats a forlorn vocoder message on "Un Peu Après Le Soleil", and their "Luceat Lux" gives rise to their most extreme, dynamic frequency massages, for "Feux" to wrap up the trip in a barbed wire bouquet of ravishing distortion. Double LP version. 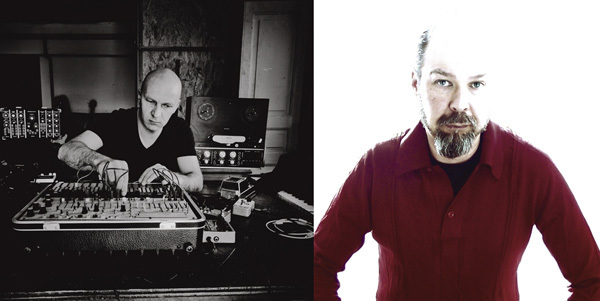 Peau froide, léger soleil is the result of a three-year recording process initiated by Mika Vainio and Franck Vigroux after a series of shared live experiences, beginning with a show in Paris in 2012. Their collaboration is an exercise in sensitive intensity, drifting through the whole space between minimalist meditations and maximalist kinetics. Vainio's signature brutalist production resonates throughout the album, constructing a psychic scenario for Vigroux's researches in spatial abstraction and tonal radicalism. Densely built through free-from structural limitation, this intense nine-track album is the third installment in the catalog of Berlin-based label Cosmo Rhythmatic, and acts as new chapter in the label's construction of an uncompromising sonic identity. Mastered by Denis Blackham at Skye Mastering. Lacquer cut at D&M, Berlin. Front cover photograph by Umut Ungan. Back cover photograph by Diego Jr.
Peau froide, léger soleil is the result of a three-year recording process initiated by Mika Vainio and Franck Vigroux after a series of shared live experiences, beginning with a show in Paris in 2012. Their collaboration is an exercise in sensitive intensity, drifting through the whole space between minimalist meditations and maximalist kinetics. Vainio's signature brutalist production resonates throughout the album, constructing a psychic scenario for Vigroux's researches in spatial abstraction and tonal radicalism. Densely built through free-from structural limitation, this intense nine-track album is the third installment in the catalog of Berlin-based label Cosmo Rhythmatic, and acts as new chapter in the label's construction of an uncompromising sonic identity. Mastered by Denis Blackham at Skye Mastering. Lacquer cut at D&M, Berlin. Front cover photograph by Umut Ungan. Back cover photograph by Diego Jr.